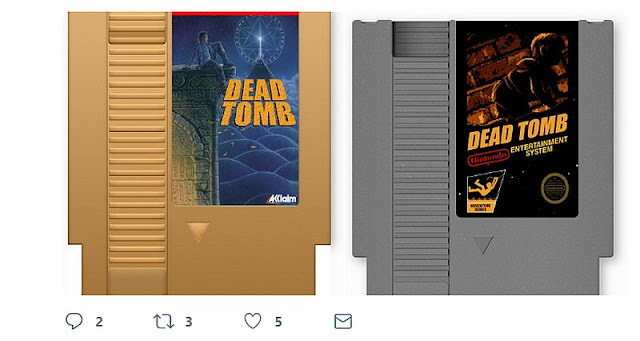 CollectorVision Games, the team behind the upcoming Sydney Hunter and the Curse of the Mayan and have just announced via their Twitter page of a new game that is coming to the NES and will be offered as a limited edition gold cart and regular grey edition cart. Titled as 'Dead Tomb', this game is a love letter to Temporel Inc and will be a point and click adventure game in which you play as part of the Videoway Corp from 3017 captured in 1300 BC by the Pharaoh Seti 1st’ soldiers and placed inside an ancient pyramid. CollectorVision Games have been creating some very nice looking games lately and this upcoming game 'Dead Tomb' looks especially nice. The adventure game itself will feature a full colour box and manual, a walk through guide, music and sound effects done with Famitracker and all of this made in Assembly. So keep an eye on the website as it will be released this summer for the NES!